WEST PALM BEACH, Fla. – Steve Wozniak, inventor and co-founder of Apple, will be the guest speaker at the South Florida Science Center and Aquarium’s gala, “The Tech Revolution,” April 4, 2014, at The Breakers. Elizabeth and Ben Gordon are chairing the gala. Wozniak, who with Steve Jobs founded Apple in 1976, will discuss innovation, creativity, entrepreneurship and his vision of technology’s future. Jeffrey and Frances Fisher, Matthew and Helene Lorentzen, and John and Heidi Niblack are serving as honorary chairmen. Howard Cox, Stuart and Alison Haft, Cater and Afsy Pottash, Heath and Karly Randolph, and Eric and Lucinda Stonestrom are host committee chairmen. Dale Hedrick and Harvey Oyer are chairing the event’s stewardship council. Wozniak designed Apple’s first line of products, the Apple I and II, and influenced the popular Macintosh. In 1985, he was awarded the National Medal of Technology. In 2000, he was inducted into the Inventors Hall of Fame and was awarded the Heinz Award for Technology, The Economy and Employment. 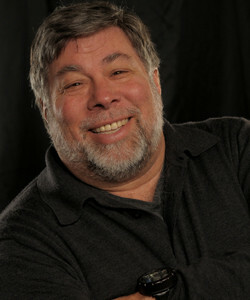 Since leaving Apple in 1985, Wozniak has been involved in various business and philanthropic ventures, focusing primarily on computer capabilities in schools and stressing hands-on learning and encouraging creativity for students. He currently serves as chief scientist for Fusion-io. For more information on the gala, contact Marcy Hoffman, (561) 370-7738 or visit www.sfsciencecenter.org.